Give the gift of health. 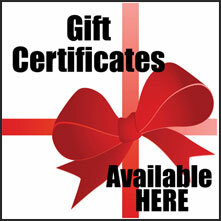 Massage therapy gift certificates are the perfect gift for family, friends and loved ones for any occasion. We can e-mail the gift certificate(s) to you and you can print and personalize it to your liking. We can mail the gift certificate(s) to the recipient. Once your order is placed and credit card information is processed, a representative will contact you (within 48 hours) to confirm your order and to discuss options 1 and 2.